Submitted by Alexander Briones on Feb. 6, 2019..
97 out of 100. Incorporating 50+ ratings and reviews. If you’re experienced with live sound, or are willing to learn, the Acoustic B30 could potentially be a very good tool both on stage and in the studio. The amp, while only rated at 30-watts, if miked has more than enough features to produce very respectable tone. This is further enhanced by the inclusion of a 12” speaker, which helps to give the amp a warmth and depth lacking in those with smaller speakers. The B30 also has plenty of punch, though because this amplifier only has a 30-watt rating this is only really going to shine through on recordings or solo practice sessions. The amp, while very affordable, has features generally reserved for much more expensive amplifiers. The B30 comes with a 4-band EQ, which control bass, low-mid, high-mid, and high (treble). The inclusion of a 4-band EQ, while not that significant at first glance, makes it significantly easier to control your place in a mix. Because the guitar is such a mid-range focused instrument, as a bassist you need a lot of control over your mid-range so that you aren’t in competition with the guitar. The amp also has built-in compression, though because you can’t control its parameters this may be a double-edged sword. If you like a more dynamic sound, you may find that the B30 doesn’t let that shine through. The B30 does come with an overdrive circuit. It’s hard to objectively compare one distortion circuit to another, but as a general rule this circuit seems to be better received than the circuit included with Fender’s amplifiers. One reviewer summarizes market sentiment nicely by saying that the Acoustic B30 is a "solid little amp". There is a lot of good talk about its sound quality, with many describing it as a warm sounding amp that can be tweaked to your liking via its wide range of control features. Good bang per buck also comes up often in reviews, especially when considering that it comes with built-in overdrive. Aside from a few who had shipping issues, there aren't that many complaints about the amp's performance itself, which means that expectations are set and met properly. 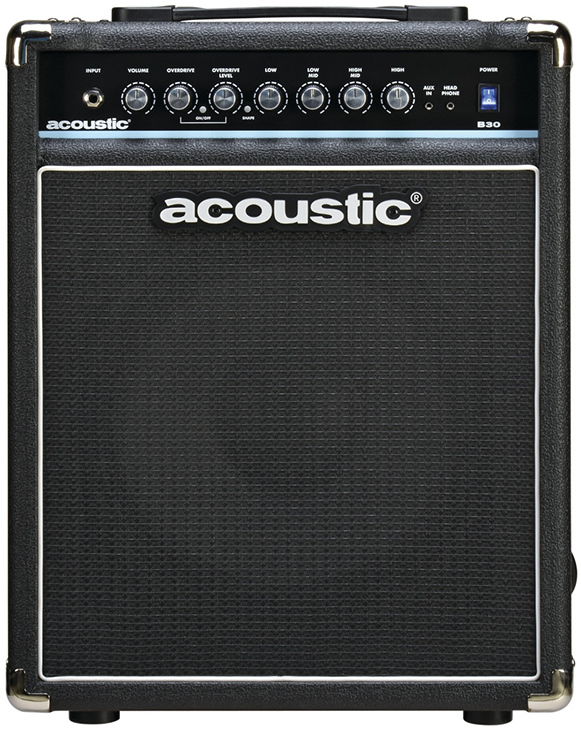 With its high ratings, built-in overdrive and simplistic appeal, the Acoustic B30 is well worth recommending. Unfortunately it's difficult to find a new one in stores these days so you might like to look at some highly rated alternatives in our guide to The Best Bass Amps Under $500.